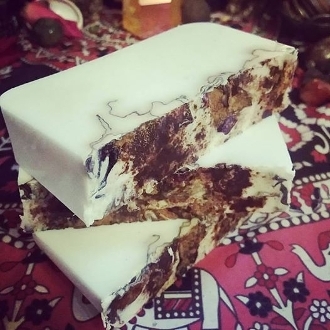 I have created a new soap using my famous Arabka Soudager oil formula! I use this oil every day, literally. I keep a bottle in my purse and a bottle at my work station and it's what I use to gamble with. I rub it on my hands at least 3 times a day and all through out while I create orders and items in order to bless the owner with abundance. It is also what I used every night at work when I worked in a bar and I made great money just in tips. It is extremely beneficial in tip based industries; servers, bartenders, hair stylists, dancers, musicians, etc. I have also won at keno with this by rubbing it on my hands before I played. I gave it to 2 other people after me, who saw what I did, they won too. Everybody wanted to buy a bottle and take me to the casino! One of my most popular oils! I have researched this name for a long time, and can not find the meaning of it, only that it appears to be rooted in Arabic. It is, however, a phenomenal recipe that packs a hoodoo wallop! This recipe has been used for ages for more and better business and a better love life! This oil rids you of blockages and purifies and calms the mind, thus leading to success. Most of the time, I find people have placed these blockages in their own minds. They don't think their ideas are good enough, or that their not smart enough, or not worth enough to have a successful life! Come on...you know you got it goin' on! Let this oil help rid your mind of those negative thoughts holding your love and prosperity back! You deserve to be successful in love and life! Work hard, be honest, say a little prayer, throw some of this on a candle...and you're set hunny! Created with Frankincense, rose, vanilla, cinnamon. Smells fantastic! Anoint yourself, wallet, door, cash box, register, front steps, you name it! The more you use the more ideas you create. feedback; "Love this oil! I use it on my wallet (and money mojo bag) and I always have extra cash coming in...just waiting to see how much it helps in Vegas! ;)" "Business has tripled since I began using this oil! I can not thank you enough!" "Wonderfully scented and it works.. I waited for a month before leaving feedback because I am a detailed person. My spirit totally changes when I use it. I won over $2,000 after rubbing it constantly in my hand while playing a penny maschine. I also annointed the money I played with in the Lucky Hand Oil and the Double Luck Oil. With good intention, faith and gratefulness Moma Sarah's products the most effective!" thanks for looking!